Suppose this fractal is drawn on a Cartesian plane, where (0, 0) is at the bottom left corner. Assume that in the example above, the bottom left point of the fractal is at (0, 1) and the bottom right point of the fractal is at (27, 1). For example, the top of the Level 3 fractal is a line from (13, 14) to (14, 14). Write a program that will keep track of the integer coordinate points of the lines in a similar 'block fractal' with its bottom left corner at (0,1). The program will accept three integers as input: the level of the fractal, the width of the fractal, and a x-coordinate. You may assume that the width of the fractal will be some power of three, and that it will be large enough so that every corner of fractal will fall on an integer intersection in the Cartesian plane. The width will never be more than 81. The x-coordinate, x, will be in the range 0 - width(inclusive). Your program should output the y-coordinate value(s), y, where lines of fractal intersect the point(x, y). 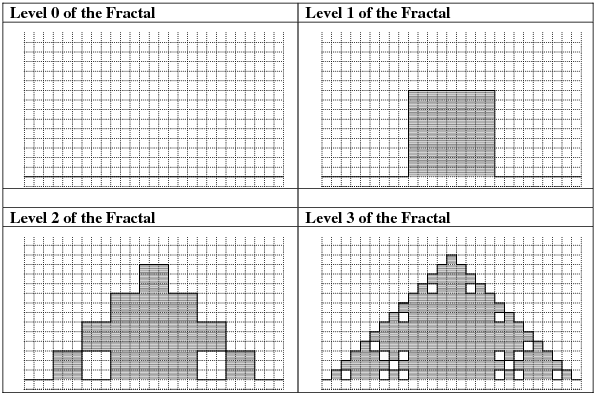 You may draw a graphic representation of the fractal for debugging (and interest). However, test cases may ask you to define fractals that are too large to fit on a single screen. If a vertical line of the fractal goes along the requested X-coordinate, every integral Y-coordinate that the line passes through (including at its endpoints) should be included. The output should be sorted and should not contain duplicates.